Before the audience ever even heard the music, they knew it was there. 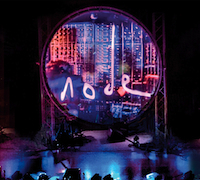 On 27 February 2015 the concert hall at the Royal College of Music in London was staged for a rare live show by Node - the celebrated collaboration between Dave Bessell, Ed Buller, Mark Ellis (aka Flood) and Mel Wesson. 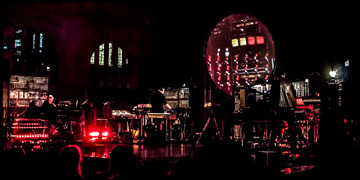 In front of those seated was a city of synthesizers, arranged and wired together in a menagerie of boxes, cases and modules... warmed up and standing ready to be played by these four men. Sparking ideas about music's ritualistic role, attendees surely felt that they were going to be part of something great - as when electricity is converted into music something wondrous is born into the world. Node Live (65'53") provides a record of this psychic income. Like the thunder, the heaviest of this album's five live tracks will awaken a primitive emotion within us. In parts where is present a bass so heavy that it can almost be stood upon, we feel an unrestrained directness of expression. As the inward spiral of echoing sequencer patterns are introduced, the brainwaves of the audience seem to align - as if in a combining of forces. Node Live captures the newness of this fleeting experience. Cross-modulated oscillators give the feel of being bombarded with cosmic rays, alongside classic Mellotron tones sounding out through cavernous reverberation. Electronic tones skip, dance and amble up and down chromatic scales in machine-like precision - supported by synth harmonies, glittering effects and the occasional electric guitar lead. Abstract thought zones provide a place to rest, without giving the impression of undoing or finality. It is hard not to celebrate the look of Node's machinery over its function. But seeing all this gear (which nearly slipped from the world's memory some years ago) assembled for a live performance may remind us that although we think we have control of it, electricity is working its will within this music and directing its every action. While Node's work may originate at an AC wall outlet, it comes to us through our ears, and truly reaches us only through our understanding. Existing in stark contrast to mainstream music, which reflects the current values and trends in society, music by Node (and their contemporaries) achieves so much more - as it reflects the current state of the human mind.